Like most moms of two toddlers I read millions of books every night (and day), somewhere in my sleep-deprived stupor after my second child’s birth I began writing a rhyme in German, my spouse’s native tongue. For some reason, I give myself more leeway to be silly in another language. Anyways I digress…in the end the rhyme became a silly, quirky book in English. When my son began singing it back to me and to himself – I thought maybe other children might like it too. However, he quickly assured me that would not be the case. I should rather publish the book with only one copy for him. I kept thinking about the lines of the rhyme and eventually distinct images were waking the little sleep I had. This led me to the talented Cristina Szemere Enderlin who brought The Mouse from Laos to life. Being a mom and human rights advocate I wanted a book (now a series with 90 titles in the works!) that celebrates diversity, stimulates curiosity and provides teachable moments about lesser-known places in the world while fostering tolerance. Although the series has an underlying theme of identity, I truly believe creating a space for awareness leads to greater understanding. The response from families and educators has been overwhelming. Initially, the book was targeting 0-6 year olds but after visiting many classrooms we were surprised how our silly simple book sparked the imagination of 10+ year olds and how many older adults were buying the book for themselves. We are so excited to be able to share our products worldwide now especially our Book Set with bag, stickers and t-shirt. Our t-shirts and bags are made by Lao young adults with disabilities and the company is female-owned. Serendipitously, everything that brought The Mouse from Laos and Moonjami Press to life was fueled by moms, including our print house. I wanted to share this experience because I believe many moms out there are writing their own tales every night and from a mom that hordes children’s books (we do not have a library in Laos) I need more to read. In March we will be releasing two more books, The Peacock from Bangkok and The Kitty from HoChi Minh City. Each book is created for small hands, soft cover and 36+4 pages. Originally I wrote the book for ages 0-6 but we have found it is ageless…and have facilitated readings with art activities with 10yo. But I also have an additional mission of giving back to others and 5% of our net proceeds from the book supports Teaching Tolerance program at Southern Poverty Law Center. Our book sets (bag, book, t-shirt, and stickers) support companies run and staffed with youth with disabilities in Lao PDR. As a company founded by a health and human rights advocate (me) we celebrate diversity in all its forms! Bianca actively supports literacy in Laos and Southern Poverty Law Center’s Teaching Tolerance initiative —her products are produced by Lao female-led business and people with disabilities. 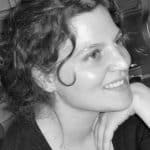 Bianca received a Master’s in Anthropology from the Graduate Faculty at New School for Social and Economic Research in New York (2004) and LLM in International Human Rights and Humanitarian Law at Europa-Universität Viadrina in Frankfurt (Oder), Germany (2018). She currently resides in Vientiane, Lao PDR with her spouse Christian, two children Aidan and Anéli and their dog Kujo. Previous Post February Picture Book Kidlit Book Bundle Giveaway! Next Post Keeping our Girls in the Game | HOW TO COACH GIRLS Blog Tour!